If you read my blog last Thursday you'll have seen my 5 goals for the summer. That's right, by the time Autumn rolls around, I'll have turned my life around and achieved mega amounts. Not one to shy away from a challenge, I set about choosing my goals. They were specific, measurable and achievable... so I thought. Many have commented on how super-ambitious they are. What can I say? I'm an overachiever! To blog three times per week, setting aside Sunday evenings for planning, writing and scheduling. To set up my home office, purchasing furniture and storage, filing everything away and working there instead of Caffe Nero. To research, pitch and write five articles in the hope of adding a bit of published journalism into my editing work. To finish the baby quilt I started whilst on maternity leave (Ruby is now 15 months old!). To schedule and go on three date nights between now and the autumn. So, how have I got on? Well, I like to think I'm easing myself in gently. I live for the thrill of the deadline so come week 9, you'll see a flurry of activity, I'm sure. This week, however, I've blogged once, done a bit of window shopping for a desk, thought about getting the quilt pieces out of their box and I'm currently writing this in... Starbucks. 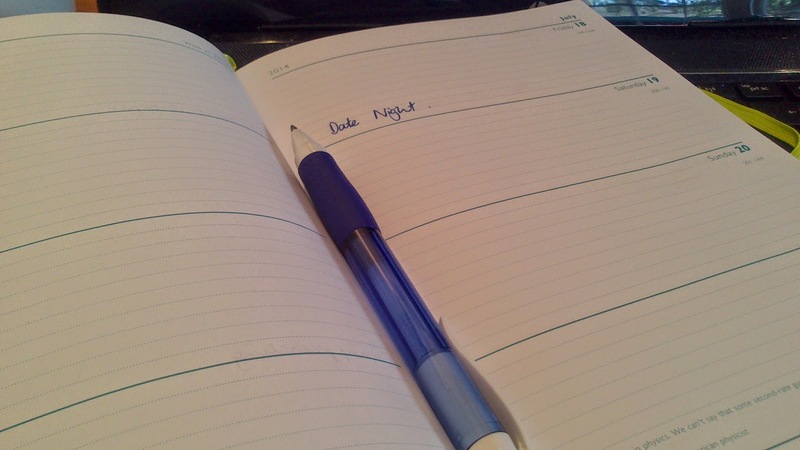 Oh, and I've just written some date nights into my diary (that's one goal, one third achieved - go me)! It has to happen now, it's in the diary! Bagging myself an exciting new editing commission with extra responsibility.... where I get to work with my friend! ... then I would have achieved them all! Taking the plunge and dying my hair... the greys are getting too much! To finish reading a book (started one last week and about half way through). To cook from scratch at least twice a week. Who knows what else I might add to my list! (... and then get done!). Join in the fun and link up over at Clarina's Contemplations. It sounds exhausting just thinking about it but you've inspired me because I seriously need to set some goals with an exam coming up in September so maybe we can encourage each other to achieve them. If you ask me though the ones you've achieved are important ones so well done and keep it up. I'm looking forward to the World Cup Final BBQ Lol. Date night is a good one to start with! Wowsers, that's a lot of goals! I think writing them down and publishing them makes you accountable though - and therefore more likely to follow through on them! Do keep us updated! I think having things written down means you are at least more likely to think about doing it, even if you don't get round actually doing it! I love your alternative goals... The ones that you HAVE met this week! #GetGoodSummer is all about easing yourself in gently! Keep going! You're doing a fab job!